A treasured symbol of your unique ability as you whirl your way through the hearts and psyche of your audiences. Both in close-up and on stage, the Star Magic Wand adds a touch of elegance and style. 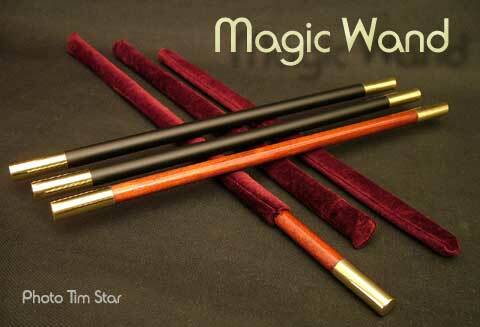 The wands are available in two styles, black with brass ends or natural wood with brass ends, one of each is ideal. The black wand has been primered, sanded and coated with our special semi flat black paint and absolutely no wood grain is showing. The wood wand is coated and hand rubbed to a semi gloss finish. The brass ends are polished to a high gloss finish and then clear coated. The Star Magic Wand has perfect balance because each end is weighted and one of the ends is magnetic. For you that wants the best.